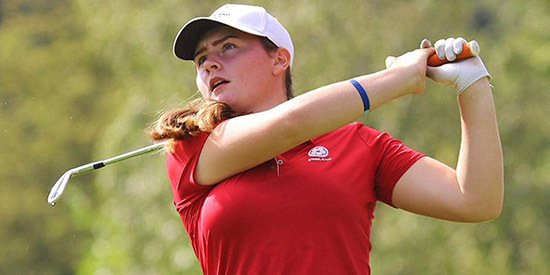 Lily May Humphreys, named in the provisional GB and I Curtis Cup squad for the 2018 defence of the trophy, leads the field with a fine round of four-under-par 68 at the prestigious Dixie Amateur women's 72-hole tournament at the Woodlands Country Club, Tamarac, Florida. Lily May who comes from Suffolk town of Sudbury, also won the English women's amateur championship in 2017. She tweeted after her first round: "Loving my first time in America so far." The 15-year-old English girl, holder of the British girls championship, as well as the European Young Masters' girls' title, dropped her only shot at the fourth before going on to birdie the sixth, ninth, 10th, 15th and 16th in halves of 35 and 33. Another English competitor, Annabell Fuller, had a 74 and is in joint 26th place overnight. Her sister Samantha withdrew before the start of the first round. Three players, 15-year-old Mimi Chen (Longwood, Florida), 14-y-o Xin Kou (Windermere, Floria) and Patty Tavatanaki, an 18-y-o from Thailand and a student at UCLA, got to to four under par during their rounds but late bogeys knocked them back to joint second place on 69. Defending champion HYujeong Son (NOrman, Oklahoma), winner by five strokes last year, matched the par of 72. Alexa Pano, who earlier this year won the Jones-Doherty championship on the Orange Blossom Florida Tour as a 12-y-o, shot an opening 74. Six strokes cover the leading 40 players after the first round.